You are here: HomenextBuildingsnextChurches and their communitiesnextMessage from Wickford, Rhode Island, USA. Part 2. Message from Wickford, Rhode Island, USA. Part 2. This is a photograph from July 1968 when The Rev. Canon Frederick H. Belden of Wickford, Rhode Island, USA, traded pulpits with the Rev. Mr Prance of St. Catherine’s, Wickford, Essex. Canon Belden (left of centre, with glasses) is pictured with Rev. Timothy Girling, Assistant to the Rector at St. Catherine’s. On Timothy Girling’s left stands Ron Goodwin who still lives in Southend Road, Wickford and who was at the time, I believe, Junior Warden. 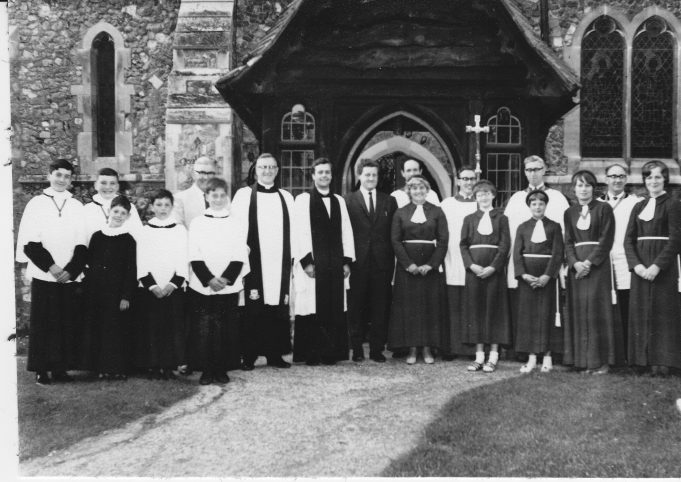 Senior Warden was Bernard Harvey, standing on Canon Belden’s right, behind a young choir member. One of the oldest field maples in the British Isles gets a new seat. St Margaret's Church, Downham - the new altar. St Margaret's Church, Downham - the new windows. Wickford Methodist Church, Southend Road. Wickford Old Church, 30 May 1873. Youth club at Methodist Church hall, Southend Road.